PVC wall covering is primarily for the decoration and protection of interior walls and partitions. Its numerous practical and aesthetic qualities make it suitable for use anywhere, but it is particularly well-suited to bathrooms, kitchens and other moisture-prone areas because it is waterproof. It usually takes the form of rolls of standard widths. The many available colors, motifs and textures allow it to blend in with any decor. 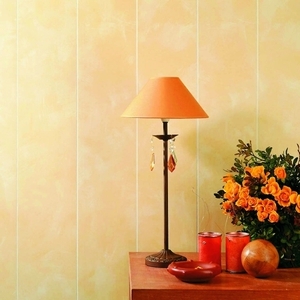 This wall treatment is found in public and commercial buildings, as well as in private homes. It is suitable for use in any room and with any decor. There are four main types of this covering. PVC over non-woven cotton is favored by individuals. The others are PVC on a paper backing, PVC foam and PVC film. The European product norm EN 259 establishes standards for sturdiness, impact resistance and durability. Overall thickness will affect the thermal and acoustic insulating qualities of the covering. The thickness of the wear layer will determine durability, sturdiness and maintenance requirements.